They said to him, ‘Who are you?’ Jesus said to them, ‘Why do I speak to you at all? *26I have much to say about you and much to condemn; but the one who sent me is true, and I declare to the world what I have heard from him.’27They did not understand that he was speaking to them about the Father.28So Jesus said, ‘When you have lifted up the Son of Man, then you will realize that I am he,* and that I do nothing on my own, but I speak these things as the Father instructed me.29And the one who sent me is with me; he has not left me alone, for I always do what is pleasing to him.’30As he was saying these things, many believed in him. Then Jesus said to the Jews who had believed in him, ‘If you continue in my word, you are truly my disciples;32and you will know the truth, and the truth will make you free.’ John 8:25-32. As man he was baptized, but he absolved sins as God; he needed no purifying rites himself—his purpose was to hallow water. . . . He hungered—yet he fed thousands. 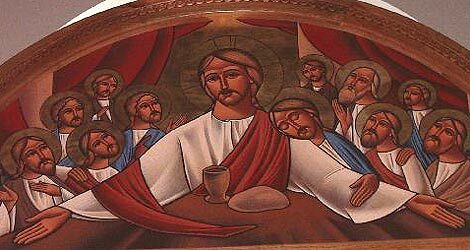 He is indeed “living, heavenly bread.” He thirsted—yet he exclaimed: “Whosoever thirsts, let him come to me and drink.” Indeed he promised that believers would become fountains. He was tired—yet he is the “rest” of the weary and the burdened. . . . He weeps, yet he puts an end to weeping. He asks where Lazarus is laid—he was man; yet he raises Lazarus—he was God. . . . .He is weakened, wounded—yet he cures every disease and every weakness. He is brought up to the tree and nailed to it—yet by the tree of life he restores us. He surrenders his life, yet he has power to take it again. . . . Yes, the veil is rent, for things of heaven are being revealed, rocks split, and dead men have an earlier awakening. He dies, but he brings life into death and by his death destroys death. He is buried, yet he rises again. He goes down to Hades, yet he leads souls up, ascends to heaven, and will come to judge quick and dead. Again, like our friend Gregory, Jesus teaches us that there’s no distinction between the life of the Father and the life revealed to us in the life of Christ. 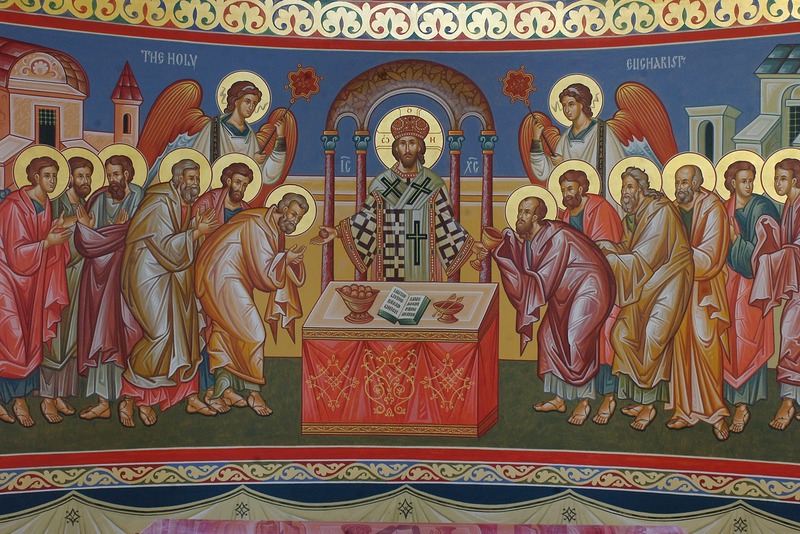 The divine unity of the Trinity cannot be carved up. That’s why in just a few moments we’ll all profess that we believe in One God. Now for most of us, we really don’t confront very often those who would separate Jesus from the Father or the Spirit. But there are plenty of places, people and things we encounter that would separate Christ—from us. Our work, our hobbies, our distractions, even our families, can get between us and a life in Christ if we’re not careful. They conspire to keep us from the life we were meant for, a life shared with the Father, the Son and the Spirit. But when we come to know Jesus, when we fall in love with the One God, we’ll find the truth. And we’ll find the freedom to be the people of God, the people we were meant to be. Amen. Mary stood weeping outside the tomb. As she wept, she bent over to look into the tomb; and she saw two angels in white, sitting where the body of Jesus had been lying, one at the head and the other at the feet. They said to her, “Woman, why are you weeping?” She said to them, “They have taken away my Lord, and I do not know where they have laid him.” When she had said this, she turned around and saw Jesus standing there, but she did not know that it was Jesus. Jesus said to her, “Woman, why are you weeping? Whom are you looking for?” Supposing him to be the gardener, she said to him, “Sir, if you have carried him away, tell me where you have laid him, and I will take him away.” Jesus said to her, “Mary!” She turned and said to him in Hebrew, “Rabbouni!” (which means Teacher). Jesus said to her, “Do not hold on to me, because I have not yet ascended to the Father. But go to my brothers and say to them, `I am ascending to my Father and your Father, to my God and your God. '” Mary Magdalene went and announced to the disciples, “I have seen the Lord”; and she told them that he had said these things to her. John 20:11-18. 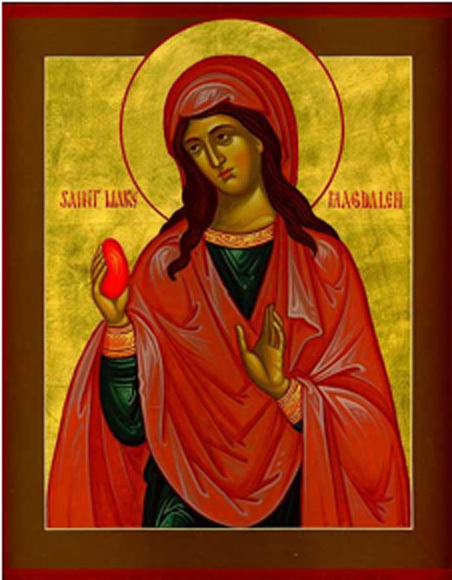 It’s a pleasure to be with you this morning as we celebrate the Feast of a great saint of the Church, Mary Magdalene. Magdalene: the first witness to the resurrection, Mary, who had her heart broken and then restored. So, I thought I’d borrow very liberally this morning from a sermon first preached by Meister Eckhart, one of my Dominican brothers, around the thirteenth century. A wonder that in such sore distress she was even able to weep. She stood there because she loved, she wept because she mourned. She approached and looked into the sepulchre. She was looking for a dead man: she found two living angels and the living son of God. 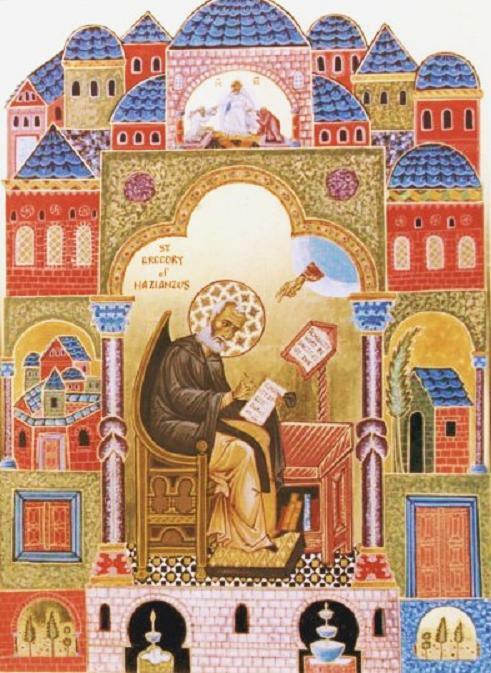 Origen says: “She stood – why did she stand when the Apostles had run away?’ Because she had nothing to lose. Everything she had was lost with Him. When He died, she died as well. When they buried Him, they buried her with Him. So she had nothing to lose. She moved on. Then he met her. She thought it was the gardener, and said “Where have you put Him?’ Anxious for Him, she does not answer His question; just, ‘Where have you put Him?’ Those were her words. Then He showed her plainly Who He was. Had he announced Himself straight away while she was in the throes of longing, she would have died of joy. Mary sought God and only God. That is why she found Him, because she desired God and nothing else. While we didn’t get to hear this part of the story, unlike the other gospels that begin the story of the resurrection at dawn, John begins this chapter “while it was still dark.” Of course, the opening phrase of John’s gospel is: “In the beginning.” John wants to take us back to the moment of creation, to another garden from which we were cast out. And the contrast of the darkness of a world without Jesus, and the light we encounter with Jesus: well, that’s quintessentially John. It’s interesting to note that the very first words Jesus says in John’s gospel are a question directed to the followers of John the Baptist: “What are you looking for?” Here, Jesus repeats almost exactly the same question, asking “Who are you looking for?” It’s a question we should each consider. Who are we looking for? It’s also important that Mary does not recognize Jesus until he calls her by name. I’m wondering whether we can hear him calling our names as well. In that moment as Jesus calls her name,”Mary”, she knows Him just as He knows his own. And she knows that death has not taken her teacher, her friend, that death has no claim on Him any longer, nor those who follow Him. And that morning, sadness had no more claim on her life, and I pray that it has no more claim on ours. Mary saw it: the kingdom of God had broken into the world. The kingdom of God is coming into the world. The kingdom of God will come into the world. Amen.